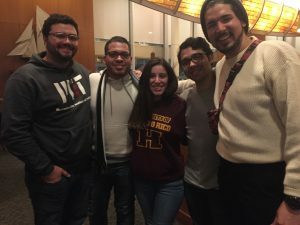 When Hurricane Maria devastated Puerto Rico and caused a historic blackout in September, the Office of the Vice Chancellor invited undergraduates from the University of Puerto Rico (UPR) to complete their studies at MIT during the 2018 spring semester. UPR’s unprecedented structural damage caused the indefinite suspension of all classes and activities at the university. OGE reached out to five seniors who had participated in the 2017 MIT Summer Research Program: Raul Mojica Soto-Albors (biology), Swanny Lamboy Rodriguez (biology), Gabriel Colon-Reyes (electrical engineering and computer science), Jean Vega-Diaz (architecture) and Angel Astacio-Echevarria (mechanical engineering). Vega-Diaz has found that his architecture program at UPR differs significantly from MIT’s program—but in a good way. At UPR, the focus is more on design within the context of spatial relations, whereas MIT integrates environmental tools to study solar daylight autonomy as it relates to energy consumption. Studying and working with the Urban Risk Lab took him out of his comfort zone. “My life changed with this research group,” he says. The students agree that the MIT workload has made time management a significant challenge for them. Although UPR offers a high-quality education, MIT’s rigor and environment is very different. For example, UPR is course-focused, while MIT provides the opportunity to work more independently and explore interdisciplinary studies. Soto-Albors has focused on neuroscience at MIT, studying how the neuron populations and the mouse brain cortex relate to visuomotor activities. “Our findings showed that different discreet populations of neurons code different behaviors,” he reports. Astacio-Echevarria has spent the semester working on control design in the Power Systems Lab, where he has been developing a power system stabilizer. Specifically, his research has centered on finding an alternative approach to designing the system. He is excited to share that he recently discovered a reasonable approximation of the power system model that could serve as a standard for power systems. As the UPR students wrap up the semester, they are deeply grateful for the opportunity to continue their studies at MIT. And despite their brief time here, they have contributed not only to their individual fields, but to the overall community, as well.